Such a busy & tired week. Overslept this morning, quickly wash up and put the clothes to wash, hoping for a bright n sunny day but no such luck... Mr Sun decided to go into hiding 15mins after I put the washing in. Dark clouds n thunder follow, shortly after rain came. It stopped nearing the noon, just in time as we have to get ready to leave for the new house. Yupe... today the SP Services is coming down to connect the gas... between 1.30pm - 3.30pm. I anticipated a long and boring wait so I brought the ipad along. However, it does not help that we are half an hour early :( Means stuck in the empty house with nothing to do but stare at the time n the walls. Little DinoEgg "entertained" himself in his room for like 30mins then he came out to find me (sitting at the balcony door) and starts his mummy-this mummy-that. I distracted him with playing ipad games with him. Now where are the SP Services guys!!!!! I'm going crazy with all the waiting and its been only 45mins. 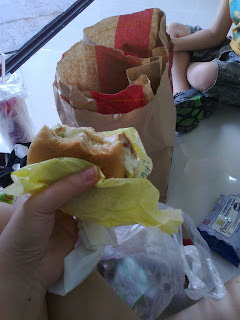 Then hunger sets in, not sure whether its due to boredom or really the tummy is crying for food, but we had heavy breakfast at 11am. Anyway, thank god for McDelivery, a quick call and its settled, we just have to wait an hour for it... And guess what, Mac Mac and the SP Services guys arrives at the same time @ close to 3pm! Hooray!!! The SP Services guys were done in like 15mins, while we are munching our burgers n fries. Quick check on the stoves and every thing are working fine. More waiting... coz daddy says he'll meet us here, or so I thought but he appears just after the PUB guys left. Woohoo!!! Finally we can leave the house! Its getting me bored n sleepy, no good no good. Heading to WowArt for Little DinoEgg's art class!